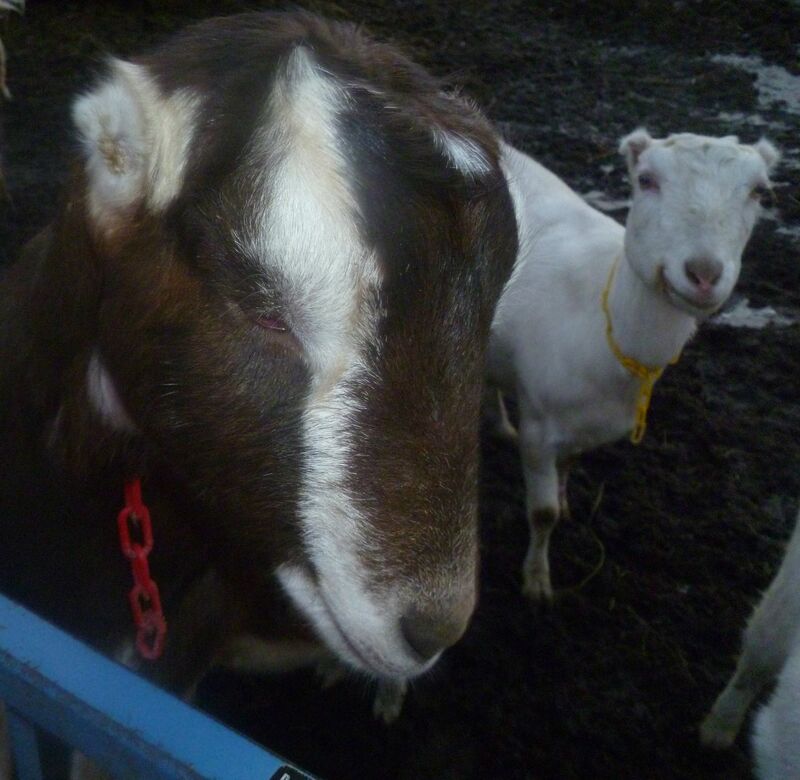 Goat breeding adventure, part who knows? Well, the goat breeding saga continues! This morning I got up, did chores, and everything was as usual. None of the animals were being obnoxious or noisy, and Pippi and SnowPea got onto the milking stand as usual. This afternoon I got home and went out, and what do you know, both Pippi and Melanzane are in heat again. AARGH! They were running around with their tails wagging a mile a minute over bright red woo-woos, yelling very loudly. (Melanzane has a cry that would wake the dead). And of course this means that the AI breeding didn’t take for them. I knew it wasn’t a one hundred percent guaranteed proposition, but Pippi is my best milker and I just can’t fathom not having her milk all this coming season. Melanzane is not even a year old yet, so I am going to let her be, but Pippi! Oh no! Yesterday was a wonderfully relaxing day. 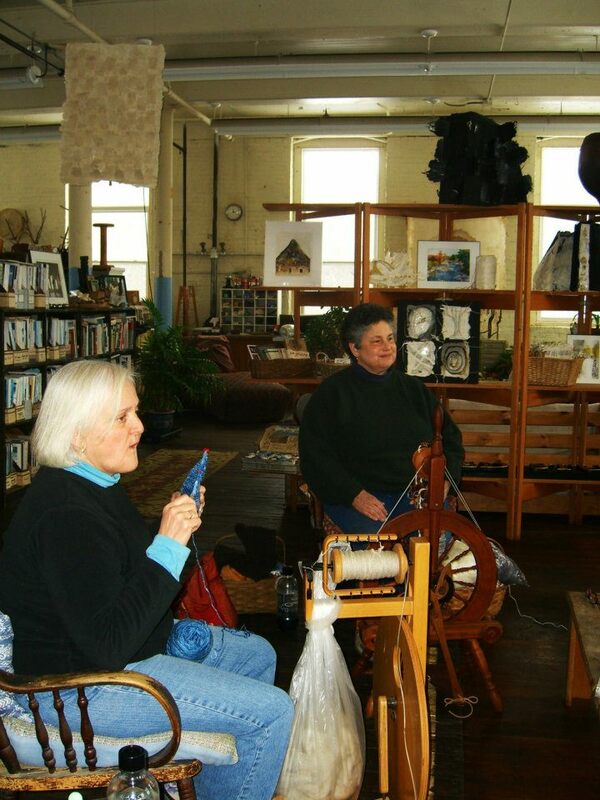 Our spinning group, the Salt Bay Treadlers, met for our first spinning Saturday. We had decided that we would love to meet more than the one evening per month than we currently do, so we are meeting on the third Saturday at our member’s homes. Our first meeting took place at an incredible place. 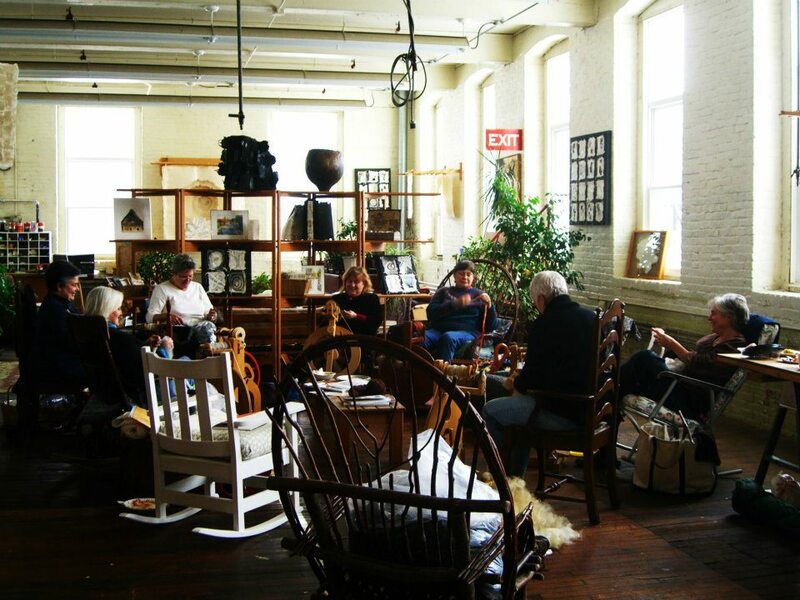 Christine has a studio space in an old mill building in Richmond, Maine (Southard Ames Mill). It’s a gorgeous old building which originally did house a spinning enterprise. There is still a functioning company in the ground floor, and they store some of their old equipment on one end of the second floor where the studio space is. It’s a fantastic area that overlooks the Kennebec River and over to Swan’s Island. Christine has much of her fiber and material stored up there, and she had shared the space for many years with a very talented paper-maker whose work is still displayed up there. Amazing stuff! We were very comfortable, and as usual, had more food than we could possibly consume. 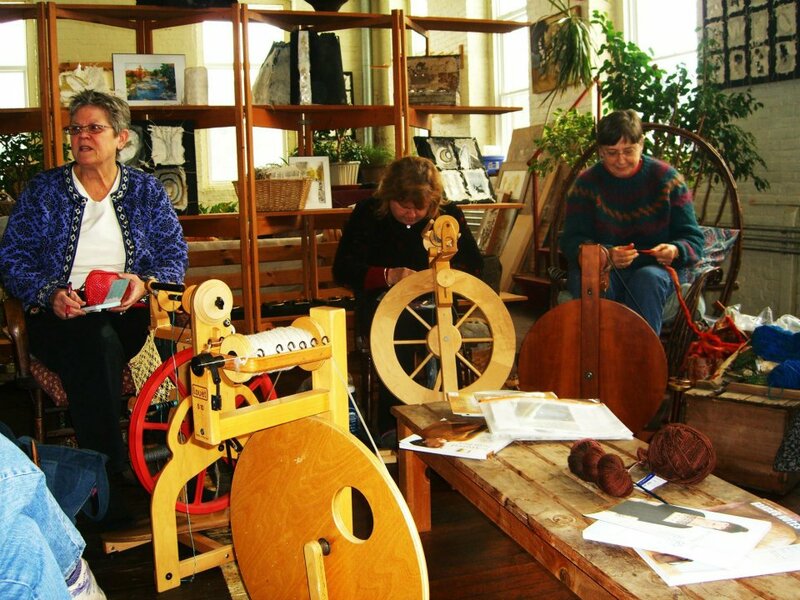 We spun, knit and laughed for hours. It was amazing! What a lovely day. It never got above 12 degrees outside but we were definitely warm and full of good cheer inside. 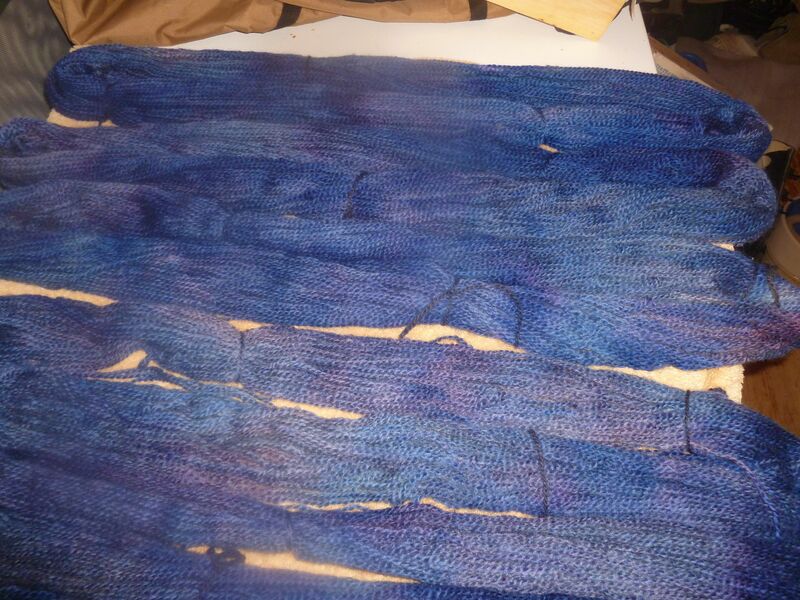 I got a whole bobbin spun up of the Blue Faced Leicester/Tussah silk roving that I got last fall. I am hoping to dye it and ply it up with the glitzy mix that I spun from the novelty roving I procured at SOAR in the autumn. It was a very satisfying day. 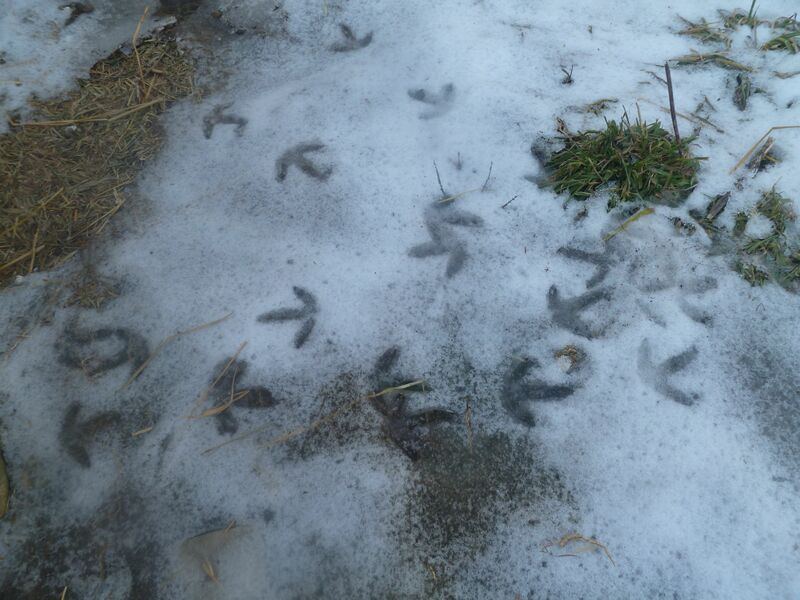 The snow did some melting on Friday, conveniently creating a sea of ice wherever it melted. Now we are in the deep freeze. 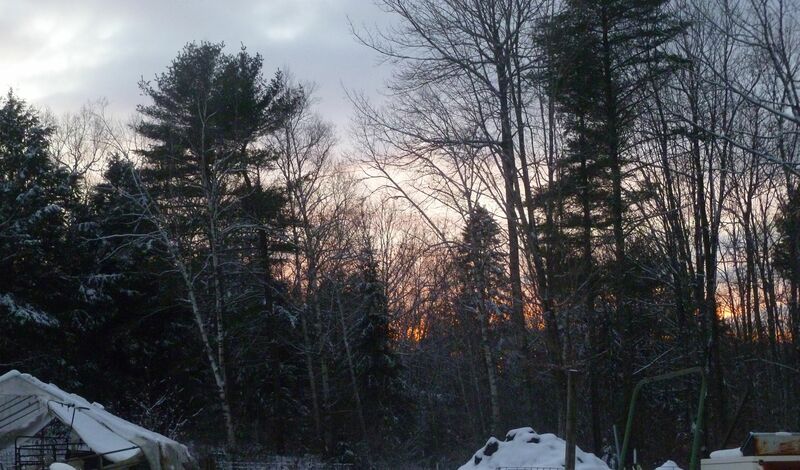 It was -8 this morning when I went out to do chores, and I put that off until a little after 7 so that I would have daylight. Brrr. This is when carrying a stainless steel bucket out to milk loses its appeal very quickly! 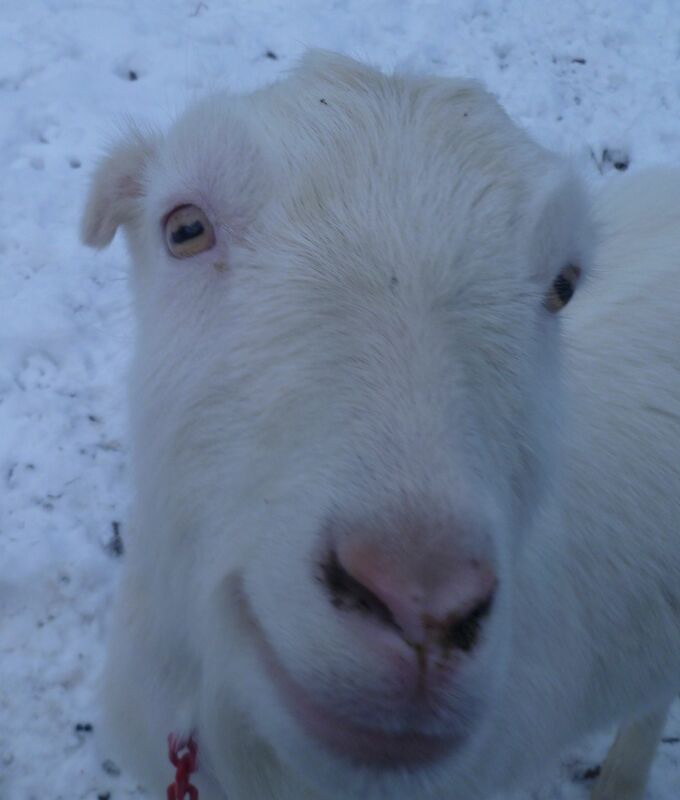 But as soon as I get going, the goatie furry bodies warm my hands up nicely, and if it’s not windy it’s ok. 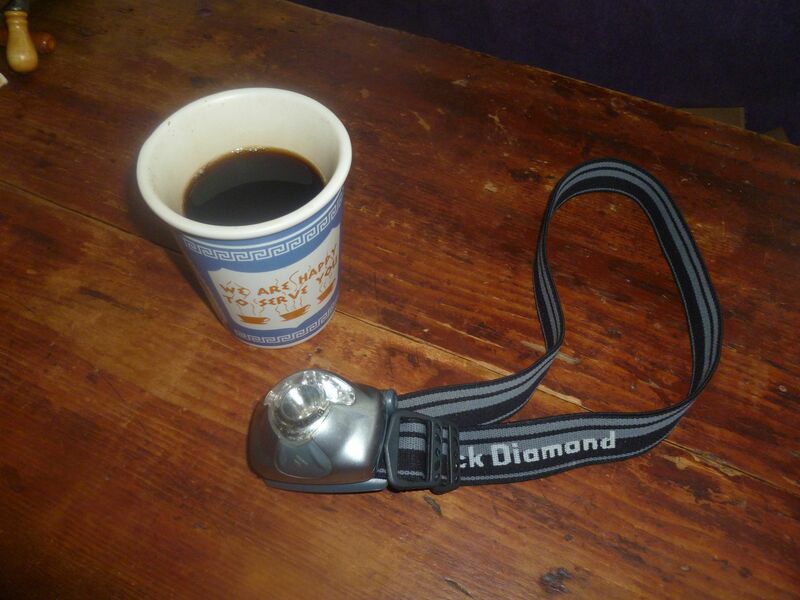 I have cut back to milking only in the morning in readiness for drying off the does. I hate to do it as it will be a long haul until we have milk again. IF any of the girls are bred, they won’t be having their kids until early June. Usually they are having their kids in April and I begin milking sometime in May. Oh dear. I have a ton of chevre in the freezer, so we shouldn’t go hungry for goat cheese, but I hate giving up the supply! Anyhow, I have not pushed myself this weekend, that’s for sure. Yesterday we went on a road trip out to western Maine. My father in law collects old Bolens tractors, and my husband found one for him that is a 1966. It even had a working snowblower on it. It was a very pretty ride. You can’t get there from here in a straight line, so we had to drive almost to Portland, and then we went the rest of the way on Route 25 which meanders northwest out of the Portland area. On the way home we did some errands and didn’t get home until almost 3. It was a long day in the Bone Shaker and my back is achy today! My poor husband hurt his back a little as they had to lift this little monster into the back of the F350, which as I have mentioned before, sits very high off the ground! There ended up being 6 guys doing the lifting, but it was still a heavy one. We have not gotten it out of the truck yet. That’s for another day, and the John Deere tractor will have to do most of the heavy lifting, thank goodness. As for today, I spent the morning doing dishes and cleaning up the kitchen a bit, and then I did some knitting and movie watching (The Freshman, one of my favorite movies). I will have to take a photo of the never-ending knitting project for another time! We finally are having some weather that looks a lot more like the season. 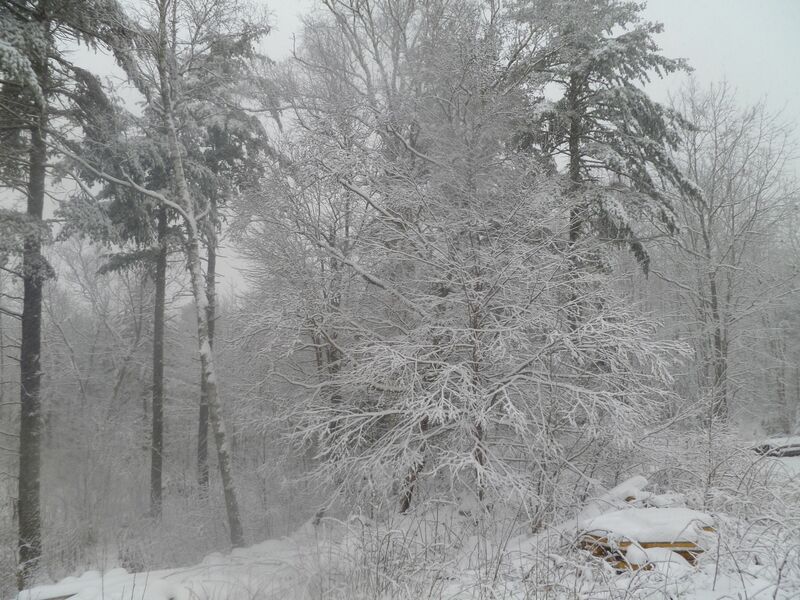 Snow, and plenty of it, is still falling. They are promising freezing rain, sleet and ice for tonight. I hope the powers-that-be at least call a delayed opening for tomorrow… I don’t want another trip to work like the last ice “event” (terrifying doesn’t even begin to describe it). All in all it’s been a very lovely day. 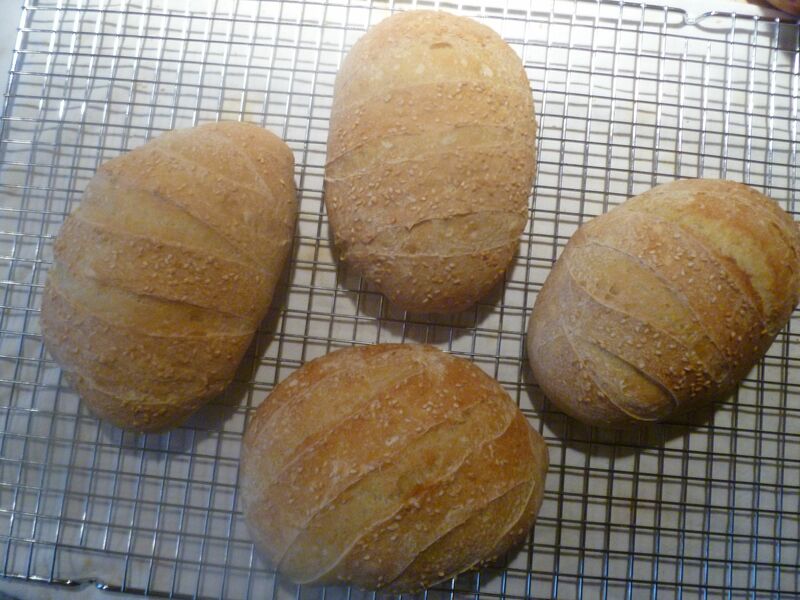 John baked up some loaves of semolina bread, I did some reading, got a short nap and movie screening in, and just generally had a relaxing few hours. Tesser and I had a chance to spend some quality time together, and now I am contemplating dinner. Hmmm. It’s almost too much for this relaxed brain to consider! Sums the morning up pretty well! Last night we had a nice evening at the Maine Agricultural Trades Show in Augusta at the Civic Center. John kindly did afternoon chores for me, and when I got home I took 5 minutes to wash my face and take a few breaths, then we headed off for the big city. Of course, the closer we got to Augusta, the more crowded the traffic became as we were hitting it pretty directly during rush hour. I don’t go there often enough to remember which lanes to favor before getting to some of the big traffic roundabouts, so it’s always a little tense! But we got there and met up with some friends and people we don’t see regularly. While I went upstairs to the sheep and goat seminar, John stayed downstairs with Christine of Maine Fiberarts and helped her rearrange the Fiberarts booth. And, true to form, I had the camera in my bag and never got it out to take any photos! Yesterday was the big day. I got home in plenty of time to get things set up in the greenhouse. Of course, it had to be that the weather decided to get more than seasonal, so the temperatures were in the teens and the wind was pretty brisk. 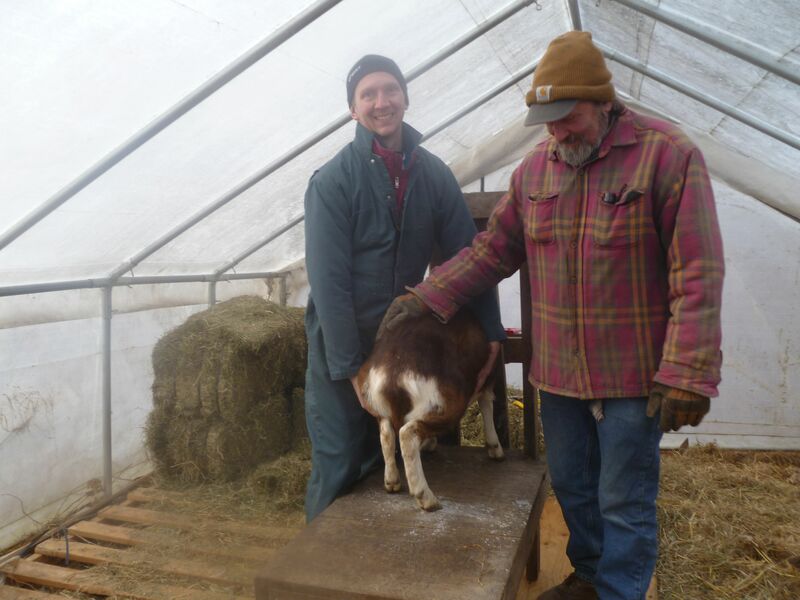 John and I decided that we should go ahead and continue with our plans to put the milking stand in the hay greenhouse, which is the most protected from the wind, and also just the warmest. I got the girls penned in the milking greenhouse, and they were bawling their heads off and flagging their tails like crazy. I think the vet hit the timing with their heat just on the money! He has a nifty van that has a nice workspace in the back where they inspect the sperm under the microscope before using the straw on the does. It’s late in the season, and we don’t know how many of the girls will get settled, but hopefully all of them will. It was a great experience watching them work, and it was much more quickly accomplished than I thought it would be. We had to hustle to keep the girls moving in and out of the pen. In the end we were very impressed with how low-key and laid back Whit the vet and his team are. They did a great job and were fun to work with. We will decide if we want to do ultrasounds in 30 days to see if we really have some pregnancies. I don’t know if it will do any good as we are getting to the end of the breeding season and it’s late already for re-breeding. But we shall see. It’s just about time to begin drying off the does and hunkering down for the rest of the winter. I will miss my milking time with the girls! 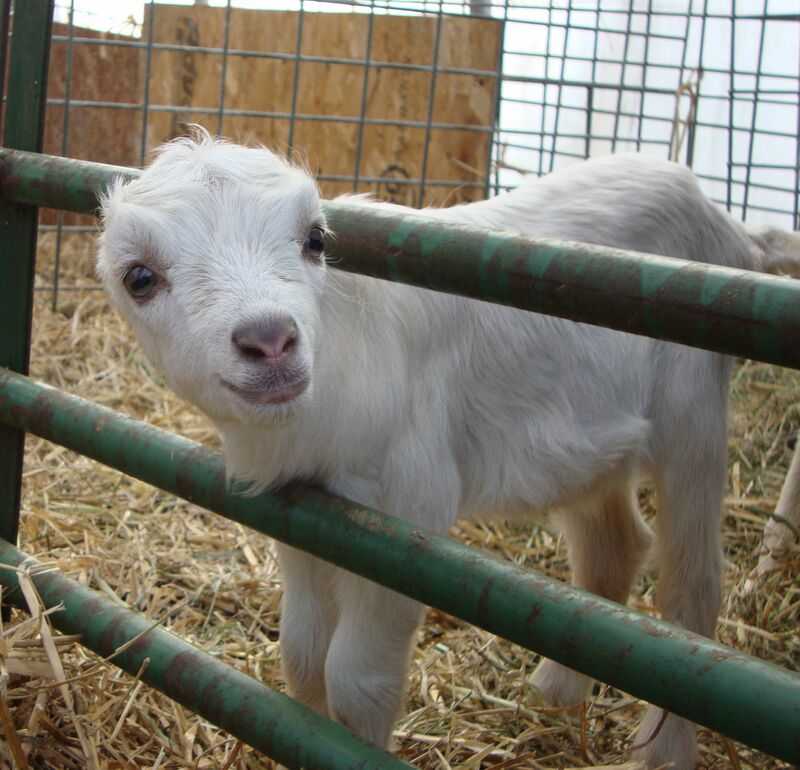 We are making definite progress in the goat breeding department. Today was the day that was appointed to give two more shots (estrogen and something called Foligon) to the girls as well as to remove the CIDR inserts. 51 hours from the removal and the shots is the target for optimal insemination. So the vet and his helpers will be here on Wednesday afternoon. The girls are not difficult to round up, and today when I went out to get them taken care of, things went fairly well. After the shots I pulled their hormone packs out, and when they went into the paddock again they got so frisky that I couldn’t believe it! Of course, today was in the 40s again and it felt very like spring… but I have a feeling that being free of the CIDR must have felt great as well! The first day of the calendar year 2012 was a beautiful and warm one, sunny and in the 40s. It gave me the opportunity to get some things picked up and cleaned up that we haven’t had a chance to get to. Whenever we *think* we need to keep a backlog of things like feed bags (because you know, they do come in handy for all kinds of things!) they frequently pile up to the point of being in the way instead of being helpful. We have had a pile in one corner of the hay greenhouse that I have been itching to get cleaned up, but snakes give me the creeps, and I knew there were snakes hiding in there during the warm weather over the summer. (I knew because I had seen them, and also there were sloughed-off skins in the pile). The snakes are excellent rodent control, but I dislike dealing with them in a confined space! It was lovely to be outside today in the sunlight and warmth, so I went to work. 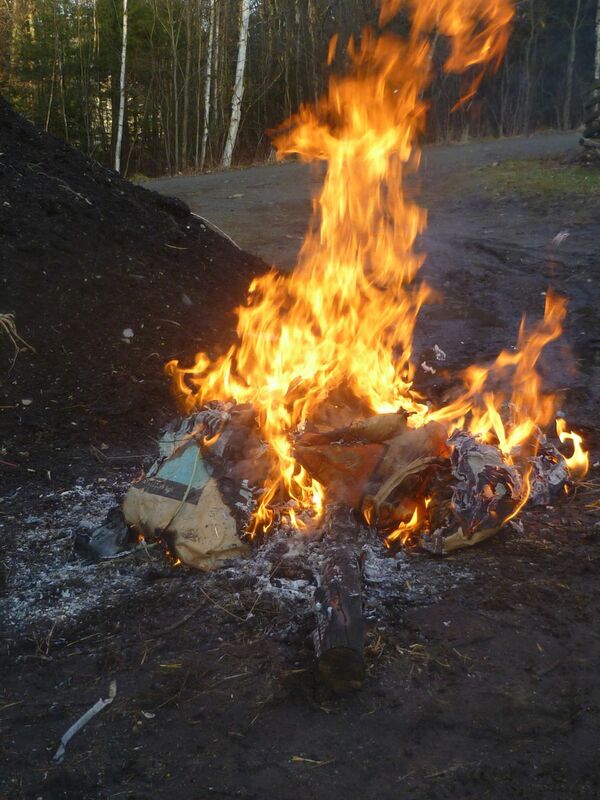 Of course I was very gung-ho and got everything cleaned out and then, as an afterthought, asked my husband if he had a burn permit, because wouldn’t it be so much easier to just burn the darn things instead of shoving them into plastic garbage bags? Poor man didn’t have a chance, so he ran down to the fire chief’s house and got a permit and we merrily set the pile alight. Everything burned very efficiently, and we even got rid of some brush while we were at it. It was indeed a pleasure! I love a clean greenhouse :*) Happy New Year to us!